Saturday, 3 July was a memorable day for the Syriac Orthodox community in the United Kingdom as His Holiness Mohoran Mar Ignatius Zakka I Iwass, Patriarch of Antioch and all the East, had come to L0ndon to consecrate their new Cathedral of St. Thomas in Acton. 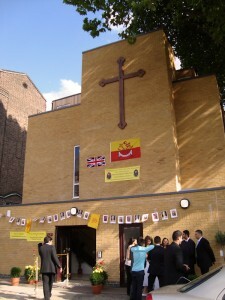 The Cathedral, situated at 7-11 Armstrong Road, Acton, London, W3 7JL, had been built in a mere six months at the cost of around 1.8 million pounds. It was an amazing story of a community pulling together under the dynamic leadership of His Eminence Archbishop Mor Athanasios Thoma Dawood. The Church is situated on the first floor with a spacious community hall below it and offices and clergy lving accommodation upstairs. 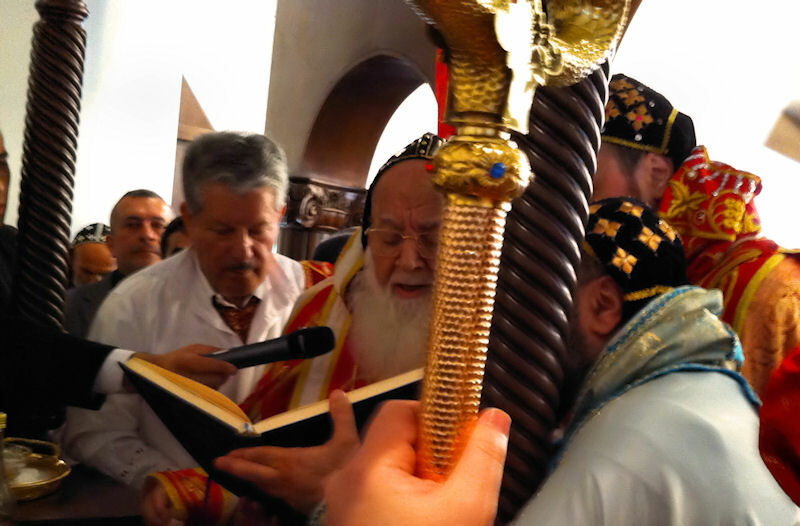 To the ringing of bells, His Holiness Patriarch Zakka was borne into the Cathedreal on his throne, carried on the shoulders of several burly deacons, whilst the congregation clapped, the women ululated and the children threw flower petals. The proceedings opened with words of welcome and the gratitude of the community (largely Syriac Orthodox from Iraq) expressed in their warm statements about British hospitality and the singing of the British National Anthem. Among messages received were one from H.M. The Queen, The Right Hon. Gordon Brown and the Archbishop of Canterbury. The Patriarch was accompanied by a large retinue of Syriac Orthodox metropolitans and clergy and relics of St. Thomas had been brought from Mosul for the new Cathedral. Among the ecumenical guests were HE Archbishop Gregorios of Thyateira (Oecumenical Patriarchate), HE Metropolitan John of Western & Central Europe (Greek Orthodox Patriarchate of Antioch), the Archbishop of Westminster (Mgr. Vincent Nichols) and the Bishop of Gibraltar in Europe (Right Rev’d Geoffrey Rowell). 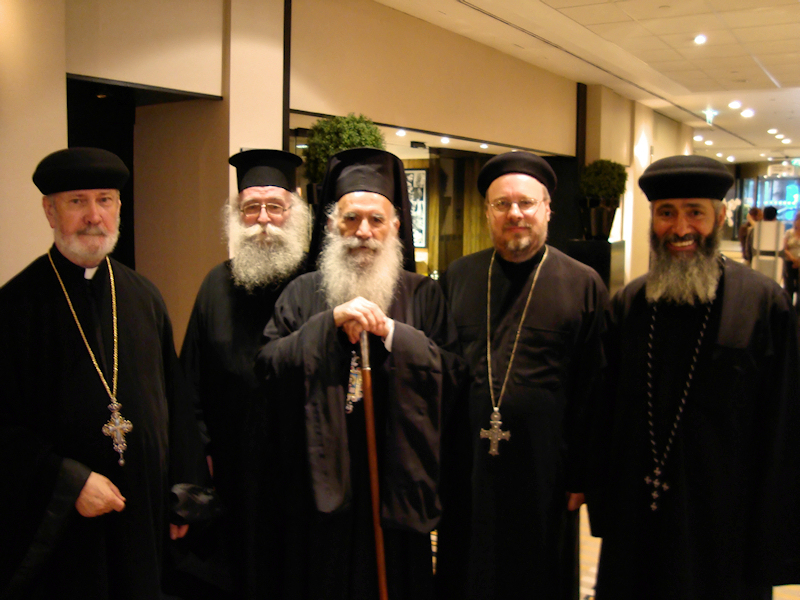 The Oriental Orthodox clergy, who joined the Syriac Metropolitans in the sanctuary, included HE Archbishop Antonios of the Ethiopian Orthodox Church) and from the Coptic Orthodox Church HE Metropolitan Seraphim (who read the Epistle in English),HG Bishop Missael of Birmingham, HG Bishop Antony of Scotland, Ireland & NE England, HG Bishop Elia of Khartoum and HG Bishop Angaelos (General Bishop for UK). A number of priests from the Coptic, Ethiopian, Eritrean, Armenian and Malankara churches were also present. British Orthodox clergy attending were Father Sergius Scott, Fr. Simon Smyth, Fr. Seraphim Mina and Fr. Peter Farrington.The Church was packed to overflowing and the service was relayed on a closed circuit tv in the downstairs hall. 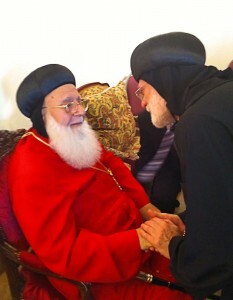 Following the anointing of the walls and altar with the Holy Myron, Mor Athanasios expressed his gratitude to those who had supported the venture and special reference was made to Dr. Patrick Sookhdeo and the Barnabas Fund on whom the Patriarch bestowed a pectoral cross and a high church decoration. In his address, Patriarch Zakka highlighted the spiritual significance of the new church. A convivial evening reception was held at the Kensington Hilton in the presence of His Holiness the Patriarh who benignly presided over the rejoicing of his faithful UK flock.